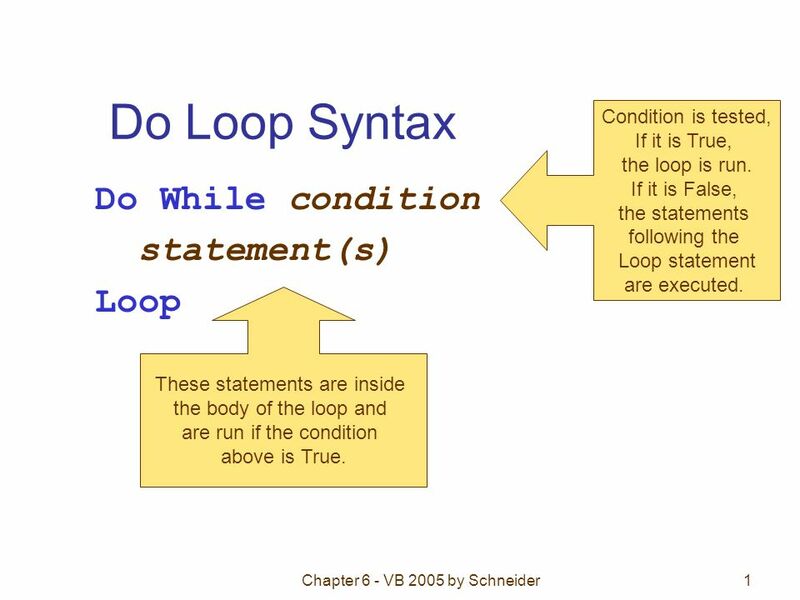 1 Chapter 6 - VB 2005 by Schneider1 Do Loop Syntax Do While condition statement(s) Loop Condition is tested, If it is True, the loop is run. 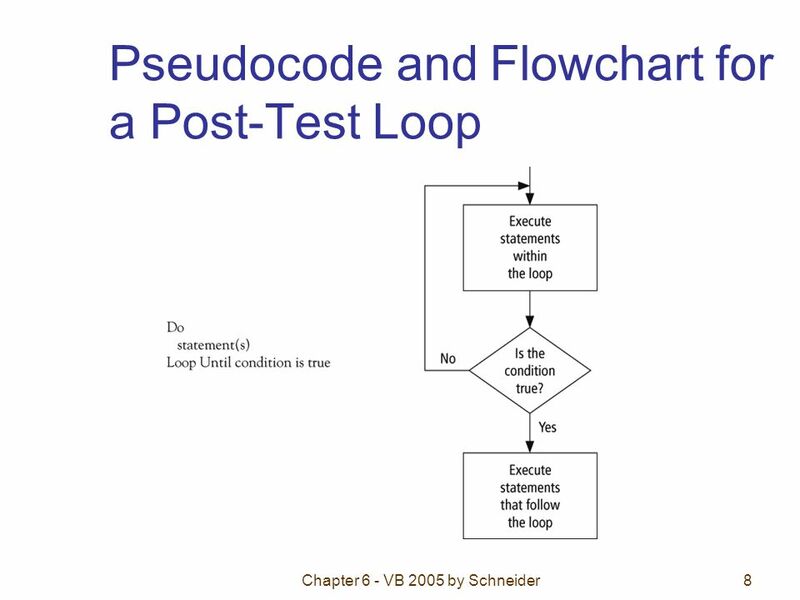 If it is False, the statements following the Loop statement are executed. These statements are inside the body of the loop and are run if the condition above is True. 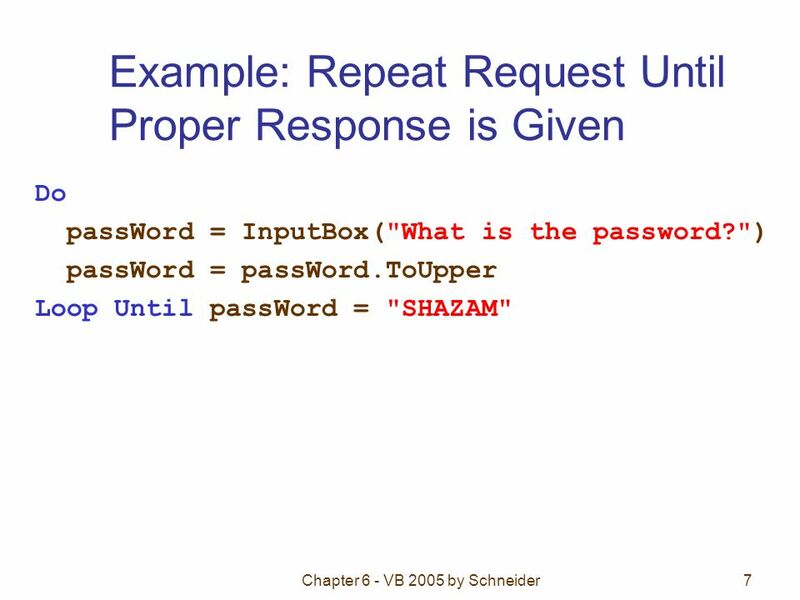 5 Chapter 6 - VB 2005 by Schneider5 Example: Repeat Request as Long as Response in Incorrect Dim passWord As String = "" Do While passWord <> "SHAZAM" passWord = InputBox("What is the password?") passWord = passWord.ToUpper Loop passWord is the loop control variable because the value stored in passWord is what is tested to determine if the loop should continue or stop. 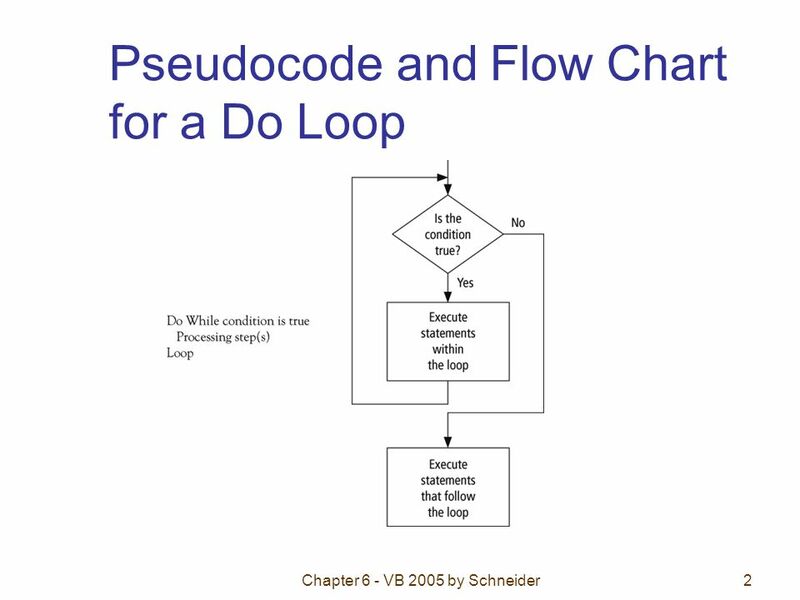 6 Chapter 6 - VB 2005 by Schneider6 Post Test Loop Do statement(s) Loop Until condition Loop is executed once and then the condition is tested. If it is False, the loop is run again. 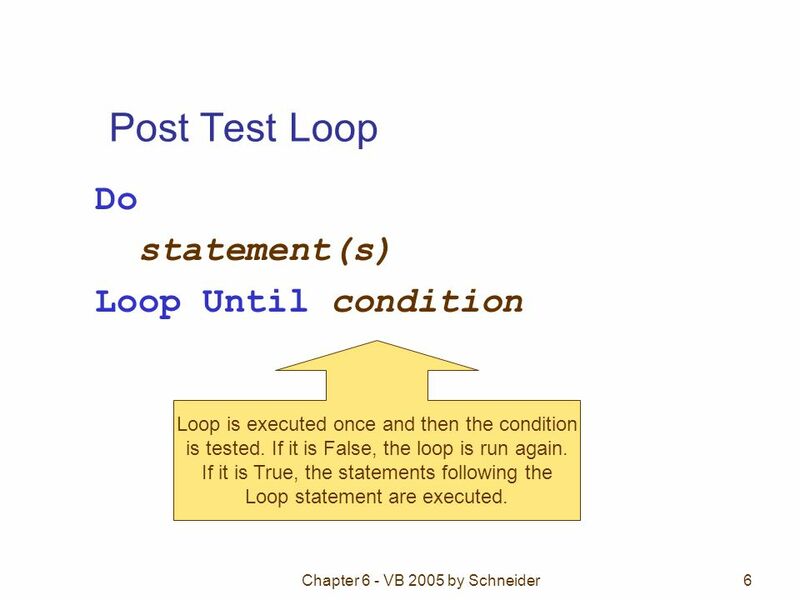 If it is True, the statements following the Loop statement are executed. 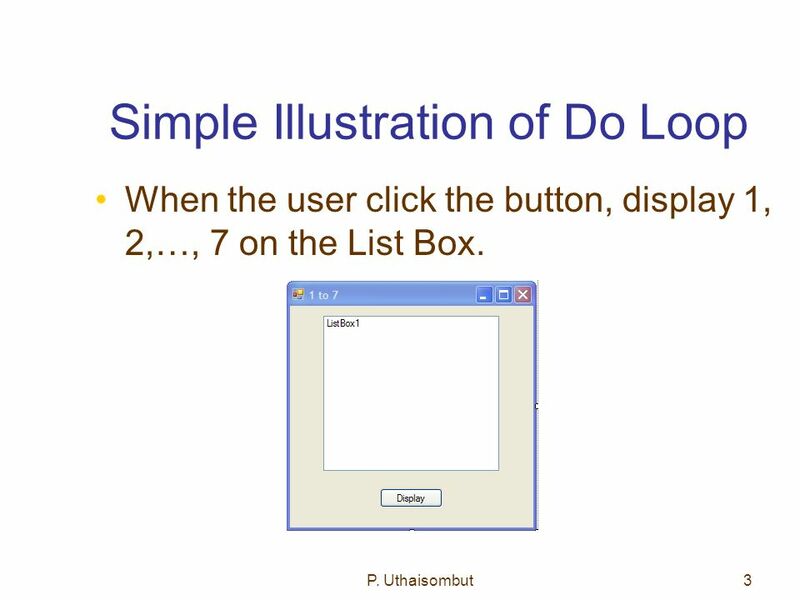 7 Chapter 6 - VB 2005 by Schneider7 Example: Repeat Request Until Proper Response is Given Do passWord = InputBox("What is the password?") 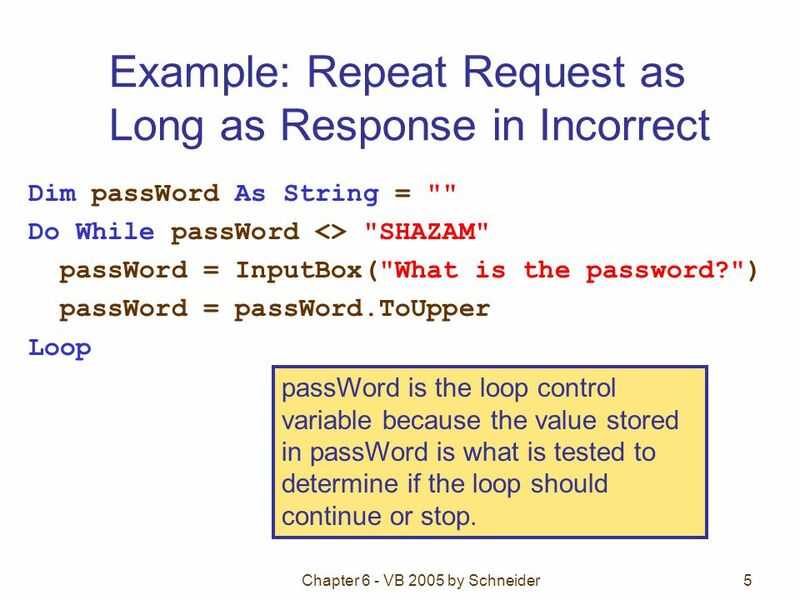 passWord = passWord.ToUpper Loop Until passWord = "SHAZAM"
12 Chapter 6 - VB 2005 by Schneider12 Comments Be careful to avoid infinite loops – loops that never end. Visual Basic allows for the use of either the While keyword or the Until keyword at the top or the bottom of a loop. This textbook will use only While at the top and only Until at the bottom. 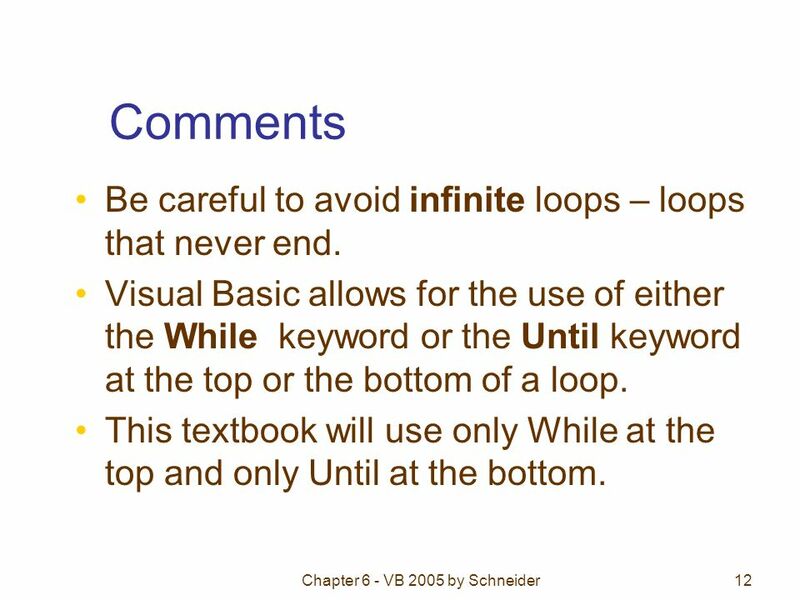 Download ppt "Chapter 6 - VB 2005 by Schneider1 Do Loop Syntax Do While condition statement(s) Loop Condition is tested, If it is True, the loop is run. 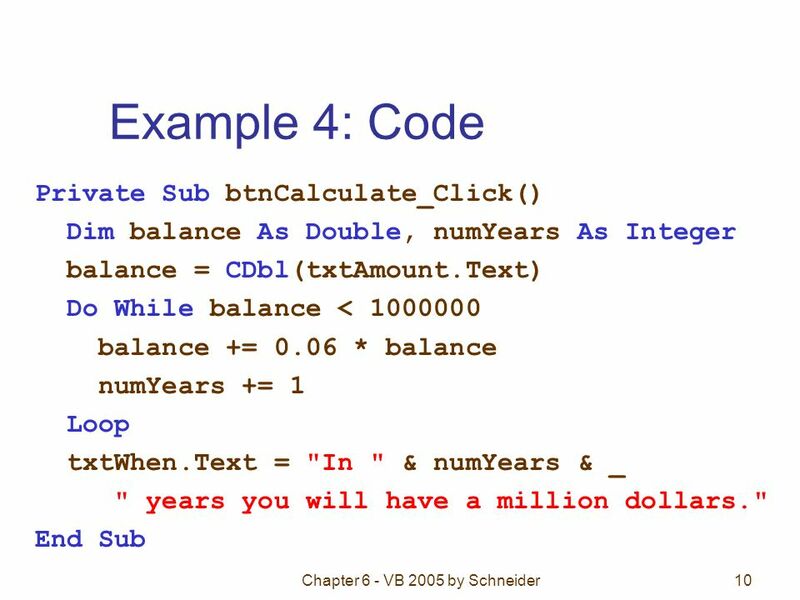 If it is False,"
Chapter 6 - VB 2005 by Schneider1 Sample Dim i As Integer For i = 1 To 5 lstTable.Items.Add(i & " " & i ^ 2) Next The loop control variable, i, is Initialized. 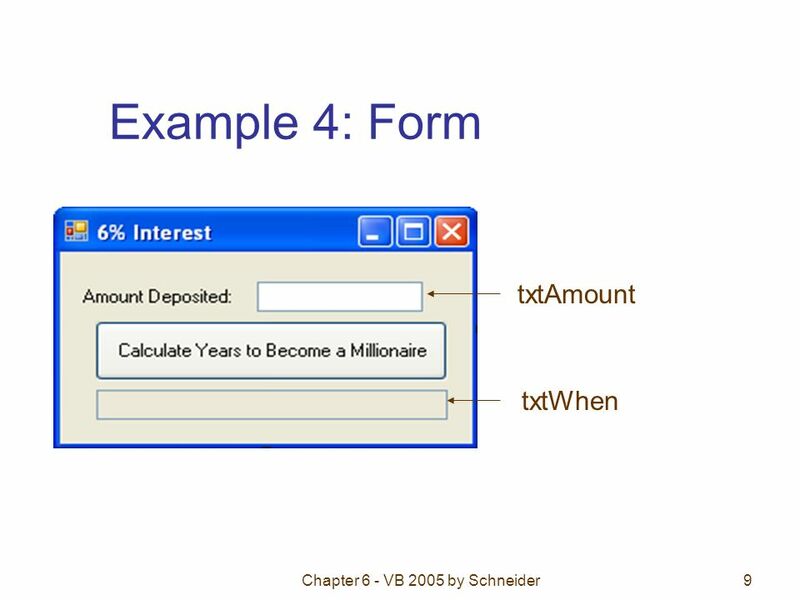 Copyright © 2007 Pearson Education, Inc. Publishing as Pearson Addison-Wesley Slide 5- 1 STARTING OUT WITH Visual Basic 2008 FOURTH EDITION Tony Gaddis. CS 4 Intro to Programming using Visual Basic Do Loops Patchrawat Uthaisombut University of Pittsburgh 1 based on lecture notes by D. Schneider. Visual Basic Statements Chapter 5. Relational Operators  OperationSymbol  Equal  =  Less than  <  Greater than  >  Not equal   Less than. CS0004: Introduction to Programming Repetition – Do Loops. Intro to Java while loops pseudocode. 1 A “Loop” A simple but powerful mechanism for “making lots of things happen!” Performs a statement (or block) over. 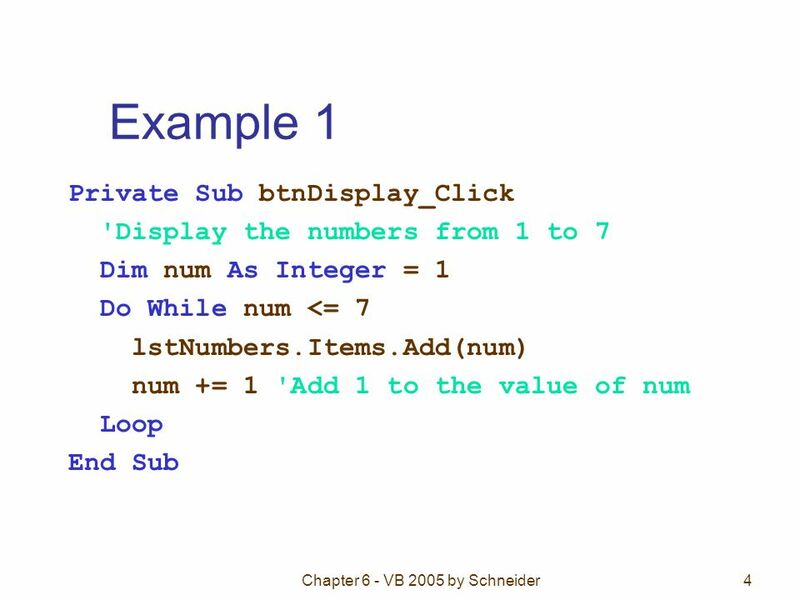 Chapter 6 - VB.Net by Schneider1 Chapter 6 – Repetition 6.1 Do Loops 6.2 Processing Lists of Data with Do Loops Peek Method Counters and Accumulators Flags. Chapter 41 Sub Procedures, Part II (Continue). Chapter 42 Local Variable A variable declared inside a Sub procedure with a Dim statement Space reserved. 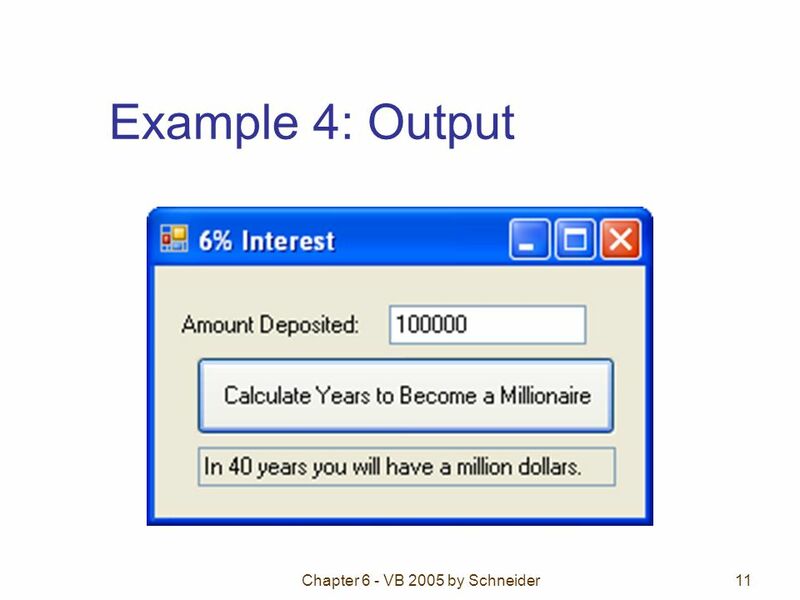 Chapter 6 - Visual Basic Schneider1 Chapter 6 Repetition. To type the VB code behind the command button (named cmdPush), Double-Click on the Push Me (caption) command button As a result the Visual Basic Code Window. Programming with Microsoft Visual Basic 2008 Fourth Edition Chapter Seven Sub and Function Procedures. Visual Basic Fundamental Concepts. Integrated Development Enviroment Generates startup form for new project on which to place controls. Features toolbox. 1 Visual Basic for Applications (VBA) for Excel Prof. Yitzchak Rosenthal. 1 Chapter 6 – Repetition 6.1 Do Loops 6.2 For...Next Loops 6.3 List Boxes and Loops.